Overall: The Amana ABR2222FES Bottom Freezer Refrigerator is one of the Top Rated Amana Refrigerators. With 22.1 cu. ft. of storage space, extremely quiet running and the durability of the Amana brand, you can understand why. 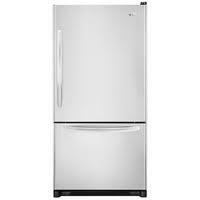 This fridge was one of the Top Performers in the Amana appliance line and remains quite popular with many consumers. It's got a bit higher of an MSRP for this type of fridge ($1,800.00) but we've managed to find it as low as $1,200.00. If you opt to not have it in stainless steel, you can find it for about $1,000.00. First off, the door with Reversible Swing was fantastic. We loved the touch controls to provide the fridge with more accurate temperature maintenance and the Temperature-controlled Chef’s Pantry™ drawer with divider will keep your meats and cheeses extra fresh. The 2 humidity-controlled Garden Fresh™ framed crisper drawers actually kept our test fruits and veggies fresh well beyond the expected "wither" date. There is no ice maker available on this unit which we felt you might miss. Colors: Our test unit was a Stainless Steel finish but it comes in Black, Bisque and White as well. Efficiency: This model is ENERGY STAR® qualified - meaning it exceeds federal energy efficiency standards by 15% to help you save energy. MSRP: $1,839.00 was the original MSRP but this model has been discontinued which makes it almost impossible to find in a store. Though you may be able to find it at a closeout warehouse at a really low price.